Administrative assistant resume example for you to adapt for your own use. This user-friendly format will help you to get to the next stage of the hiring process. Get the job you want with a results-driven resume that presents your administrative skills, strengths and abilities in the most positive way. Write a powerful resume objective that gets your application noticed. Insert your own information in the sample resume, adapt the administrative assistant cover letter and prepare for the job interview! Administrative assistant position in a professional company. To secure the position of administrative assistant in an established company. fast paced, professional environment. Proven computer skills with good working knowledge of different computer applications. An independent worker who is able to multi task and meet deadlines efficiently and accurately. Strong problem-solving skills and initiative evident in the implementation of efficient data management systems. office procedures. Proficient in a wide range of computer applications. Solid bookkeeping skills, excellent scheduling skills and a strong background in customer relations. Recognized for the ability to manage multiple tasks and projects and successfully meet deadlines. A self directed worker who enjoys a fast paced work environment. Outstanding office skills and knowledge of office management procedures. Provided administrative and secretarial support to a large department, managed a number of simultaneous projects and met deadlines consistently and accurately. An independent worker recognized for a proactive approach to problem-solving. Proven experience in a demanding work environment dealing successfully with competing needs and different challenges. Always adapt your resume to the target job opportunity. Writing an objective for your resume can be difficult. 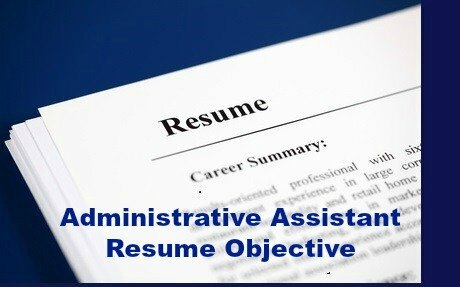 Get help with developing an effective administrative assistant resume objective using these examples and tips and techniques. Insert your own job information into the resume sample. 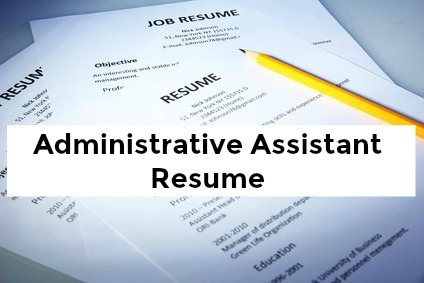 Use the detailed administrative assistant job description to help you with your administrative assistant resume. View the administrative assistant duties relevant to administrative assistants in different environments including sales, marketing, medical and human resources. Always include a cover letter with your resume and job application. Customize the sample administrative assistant cover letter and make sure your resume gets read. If you are looking for an entry level position this entry level administrative resume will help you. Highlight your strengths in your resume and get the reader's attention. Including the right resume keywords will ensure your resume gets found by potential employers. Prepare for your administrative assistant interview by going through these interview questions with answer guidelines. These sample resumes will help you to develop a job-winning resume.